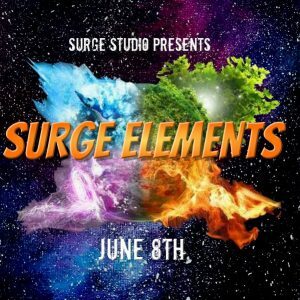 We are so excited for our 2019 youth dance showcase, “Surge Elements”, where all of our dance numbers will revolve around earth, wind, fire, water, and space! This year, we are having 2 shows, so be sure to read the information below and purchase your tickets! If anyone would like to purchase a flash drive copy of the show, you can do so at the studio, or you can make your purchase online in your account through the online store and pick up your flash drive at the studio at a later date. To log in or create an online portal, click here. All tickets will be available for purchase between April 1st-June 1st. Once purchased, you will be able to pick your ticket(s) up at will-call the day of the show. There is no need to print out a receipt. Tickets will NOT be sold at the door unless there are available tickets after June 1st.